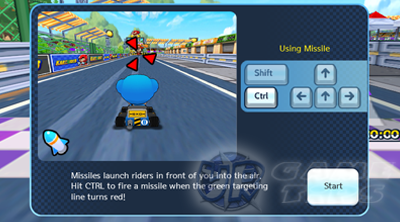 In Items Mode, you will be taken into a race without rules! Quickly gather offensive items to destroy your opponents' pace or defensive items to secure your place in the race. Refer below to learn more about KartRider Dash's Items Mode option. these items to trap your enemies and to protect you from attacks. 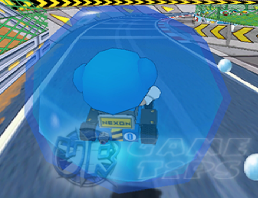 - If you are placed in the middle, you get more offensive items to attack racers ahead of you. - If you are placed in the last, you will get more Nitros and attack items. 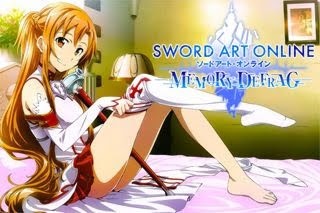 - To avoid attacks from your opponents, buy some Auto-Block items in the store. - Recommended Auto-Block items: Water Wisp and Spaceship. to get 500 Money total, then buy a "Full Fuel" item in the store for 500 Money. If you can win all races, you can play as long as you want! for is the racer directly behind you. Out race them all and land traps to secure your place! - The team of the rider who places first wins. your teammate will place first after the race. Homing Missiles if you are in the lead! This is because, you are not just going to mind the enemy behind you but also his or her teammates! - If you are a good speedster and trapper go for the 1st place! enemies with offensive items. This way, you can help your teammates place 1st during the race. - Water Bomb + Nitro: You might get caught in your own Water Prison! - Magnet + Nitro: You already have a speed boost while magnet is in effect.